Since I’ve been on a Roman ruin roll recently, I’ll share some photos of what must be the closest ruined Roman city to Antalya. Lyrboton Kome is right on the northern edge of the city, just north of Varsak. Anything closer to Antalya has, well, been swallowed up by the city. The terminus of Antalya’s newest light rail line is only about 1km from Lyrboton Kome. Kepez Belediyesi, the local municipal government, is making Lyrboton Kome into an “archaeology park”. I don’t really know what that’s supposed to mean, but it ought to at least be enough protection to keep Antalya’s urbanization at bay. Just like my previous week of bicycle touring, this final week of my three-week Fethiye to İzmir trip was hopping from one set of Roman ruins to another. In addition to Roman sites I also managed to find a few old churches. For me the most notable difference of this week was that the rain stopped. I entered a stretch of brilliant weather — dry and cool, at times cold — and tried to take advantage of the sunshine. 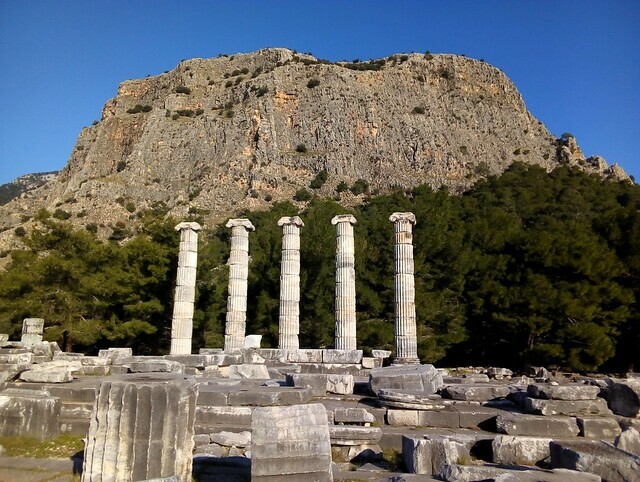 My first stop was Priene, just down the road from Miletus. Priene was built on small hills above the sea. The “acropolis” of the city is actually way up on top of the mountain in this photo, but I didn’t bother walking up there. After years of sedimentation, now Priene overlooks agriculture land in the flat Büyük Menderes floodplain. Only later did I learn that Priene is famous for its square bouleuterion. I noticed it on the map while I was there and looked around for it a bit. I thought I was right on top of it and decided it hadn’t been excavated or wasn’t around anymore or something, but there are heaps of photos of Priene’s bouleuterion on the internet. How’d I miss it??!! 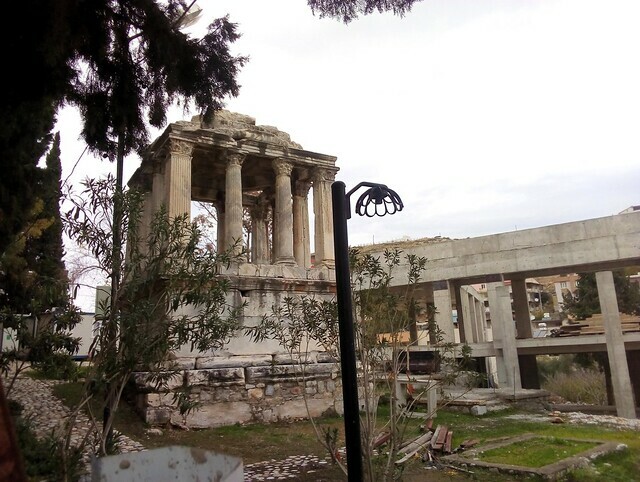 Well, at least I managed to find the theater and the few remaining columns of the Sanctuary of Athena. On the first week of this bicycle tour I went through Bodrum, anciently known as Halicarnassus, famous for the Mausoleum at Halicarnassus, one of the Seven Wonders of the Ancient World. The mausoleum was destroyed over 600 years ago by earthquakes so it wasn’t a big disappointment to find that there’s really not much left at the site — some stones and a small, somewhat neglected museum. 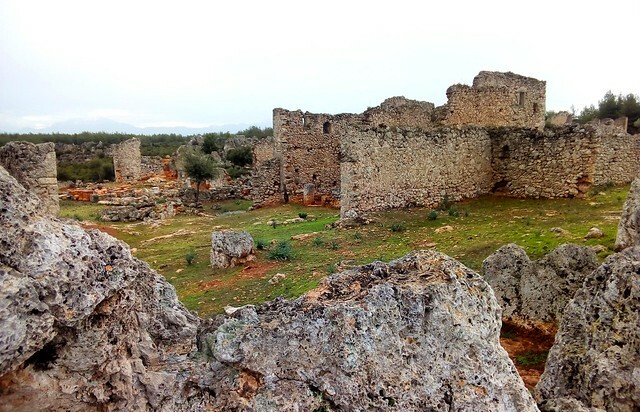 On my cold, rainy “rest day” in Milas, I hitchhiked up to the ruined Roman city of Labranda. On the map it looks like it could make a nice bike ride, but I’d been warned of heavy, heavy truck traffic on this road for the feldspar mining. Warning: if you’re on a bike, don’t think you can use the parallel road farther east to avoid the traffic — many trucks go up the Labranda road and down the other road back to Milas. The only reasonable bicycle option would be to come from Karpuzlu and head down the road via Labranda. You’d still have heavy truck traffic, but it’d be mostly downhill, and the distances aren’t so long. However, the site really isn’t so interesting. There are many better ruins around. My first (and last) bicycle tour in Turkey in 2018 didn’t start till December. Ferda wanted to go to İzmir and help out Seda with her new baby. She took the bus — actually, I guess she flew –, but I decided it made sense to bicycle there. 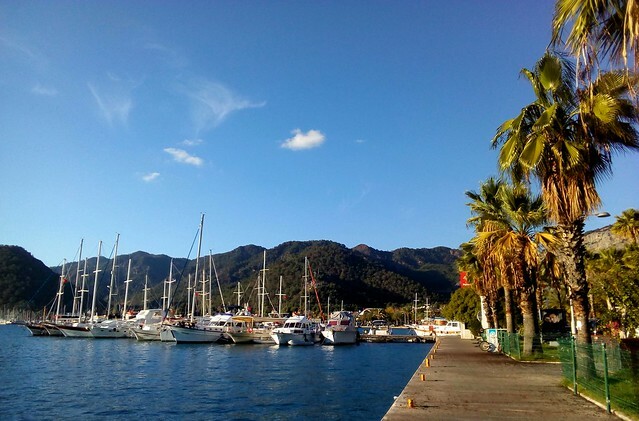 Since I had already cycled two routes between Fethiye and Antalya, I took a bus to Fethiye and started my tour to İzmir from there. 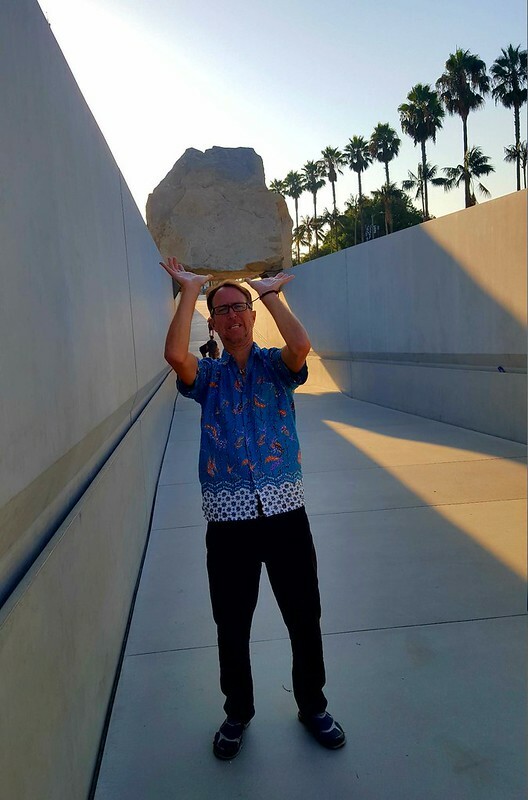 Oh, isn’t this the classic tourist pose (at Los Angeles County Museum of Art)? When I was talking with Bill at McNeil River about the incredible moon jellies that we saw in SE Alaska, he said we really must visit the Aquarium of the Pacific in Long Beach because they have quite the jellyfish collection. What a great suggestion. The aquarium’s been open for 20 years, but my parents had never been there. It had been on their list for a long time so Ferda and my visit to southern California was a good excuse to go. The aquarium had a couple tanks of moon jellies, and in one tank you were actually permitted to touch them.